Here is the list of the hotels near Busserolles. Book your hotel near Busserolles today, Thursday 16 May for the best price, reservation and cancellation free of charge thanks to our partner Booking.com, leader in on-line hotels reservation. Below here is the list the 50 closest hotels of Busserolles, sortable according your criteria. You will find the position of these accommodations on the Busserolles hotels map. Boasting accommodation with a private pool, Le Triangle is set in Roussines. The accommodation is 35 km from Angoulême. The holiday home is fitted with 3 bedrooms and a fully fitted kitchen with a dishwasher and an oven. La Preze golf course is nearby. Horse riding and hiking are popular activities in the surroundings. Brantôme is 38 km from the holiday home. The nearest airport is Limoges International Airport, 48 km from the property. Guest accommodation Roussines Preferred hotel ! La Belle Vue is situated in Roussines. This property offers access to free WiFi. The holiday home includes a kitchen with an oven and a microwave, as well as a kettle. The holiday home offers a terrace. Angoulême is 46 km from La Belle Vue. The nearest airport is Limoges International Airport, 70 km from the accommodation. Le Castel is located in Roussines and offers a garden. This property offers access to free WiFi. The holiday home includes a kitchen with a microwave and a fridge, as well as a kettle. Angoulême is 46 km from the holiday home. Limoges International Airport is 70 km away. Boasting a garden, La Caleche provides accommodation in Roussines with free WiFi and garden views. This property offers access to a terrace. With 2 bedrooms and 1 bathroom, this holiday home comes with a TV. The accommodation is equipped with a kitchen with a dishwasher and microwave. Angoulême is 46 km from the holiday home. The nearest airport is Limoges International Airport, 70 km from the property. Located in Roussines, La Dependance offers accommodation with a private pool, free WiFi and private parking. Guests staying at this holiday home have access to a fully equipped kitchen. Providing access to a terrace, the holiday home consists of 3 bedrooms. The holiday home also features 1 bathroom. Angoulême is 46 km from the holiday home. The nearest airport is Limoges International Airport, 70 km from La Dependance. 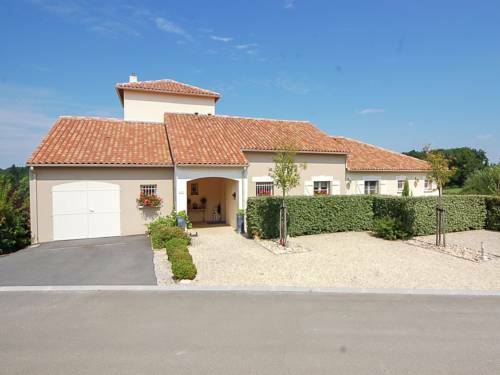 La Belle Cour is situated in Roussines and offers a garden. Guests staying at this holiday home have access to a fully equipped kitchen. Opening onto a terrace, this holiday home comes with 3 separate bedrooms. Angoulême is 46 km from the holiday home. The nearest airport is Limoges International Airport, 70 km from La Belle Cour. Le Cabriolet is situated in Roussines and offers a garden and a terrace. Free WiFi is provided. The 2-bedroom holiday home has a kitchen with a dishwasher and 1 bathroom with a shower. Angoulême is 46 km from the holiday home. The nearest airport is Limoges International Airport, 70 km from Le Cabriolet. Boasting a garden, private pool and lake views, House Lakeview is located in Roussines. The property has pool views and is 50 km from Angoulême. This holiday home comes with a seating area, a kitchen with a dishwasher, and a satellite flat-screen TV. The holiday home offers a seasonal outdoor pool. There is a barbecue at this property and guests can go cycling nearby. Limoges International Airport is 59 km away. Situated in Roussines in the Poitou-Charentes region, Holiday Home Montizon features a garden. Offering free WiFi, the property also has water sports facilities, a tennis court and barbecue facilities. The holiday home includes 3 bedrooms and a kitchen with an oven and a coffee machine. The holiday home offers an outdoor pool. Holiday Home Montizon provides a terrace. Angoulême is 46 km from the accommodation. Limoges International Airport is 63 km away. Set in Étouars in the Aquitaine region, Bébé Coin Coin features a garden. The accommodation has free WiFi. The holiday home is fitted with 1 bedroom, a kitchen with oven and microwave, and 1 bathroom with a shower, free toiletries and a washing machine. A flat-screen TV is available. The 24-hour front desk can offer helpful tips for getting around the area. The holiday home offers a hot tub. In addition to an outdoor pool, Bébé Coin Coin also offers a barbecue. Angoulême is 41 km from the accommodation, while Brantôme is 36 km away. The nearest airport is Limoges International Airport, 73 km from Bébé Coin Coin. Set in Piégut-Pluviers, Les Gites De L'ancienne Gare provides accommodation with free WiFi and a garden with an outdoor swimming pool. Offering pool or garden views, each unit comes with a kitchen, a satellite flat-screen TV and DVD player, wardrobe, a washing machine and a private bathroom with bath and free toiletries. An oven and coffee machine are also offered. The holiday home offers a terrace. Angoulême is 42 km from Les Gites De L'ancienne Gare. The nearest airport is Limoges International Airport, 46 km from the property. Set in Champniers-et-Reilhac, Gites Les Arbres provides accommodation with free WiFi and a kitchen. All units are equipped with a dishwasher, oven, a coffee machine, a microwave and kettle. A patio with garden views is offered in every unit. Brantôme is 40 km from the holiday home. Limoges International Airport is 60 km from the property. La Belle Maison is set in Piégut-Pluviers. Guests staying at this holiday home have access to a fully equipped kitchen. The holiday home features a flat-screen TV and 2 bedrooms. Brantôme is 35 km from the holiday home. The nearest airport is Limoges International Airport, 66 km from La Belle Maison. Chambre d'hôtes à tramer is located in Les Dognons. This bed and breakfast provides accommodation with a terrace. The bed and breakfast is equipped with a flat-screen TV. A continental breakfast can be enjoyed at the property. Limoges International Airport is 57 km away. Featuring free WiFi, a seasonal outdoor pool and a sun terrace, B&B Chez Phil & Cathy offers accommodation in Soudat. Free private parking is available on site. Both bedrooms are converted attic space. There is plenty of headroom and light is provided by Velux windows. Tea and coffee making facilities are available. You can engage in various activities, such as cycling and canoeing. Angoulême is 32 km from B&B Chez Phil & Cathy, while Périgueux is 48 km away. The nearest airport is Limoges International Airport, 55 km from B&B Chez Phil & Cathy. This 2-star Motel Grill Les Coursaux enjoys a perfect location in the Limousin-Périgord regional park, close to Limoges, Angoulême and Périgueux. Choose among 9 fully-equipped rooms in which you will find all the amenities and comfort you may need: air-conditioning, wireless internet, etc. The hotel also boasts an outdoor swimming pool in which to take a refreshing dip before lazing on the terrace. The surrounding area is known for its prehistoric caves, castles, fortified villages, towns and villages to visit. Fishing and biking are also two popular activities in the area and there is on-site secure parking for bikes. Situated in Saint-Mathieu, Number 15 features accommodation with free WiFi and a terrace. A continental breakfast is available daily at the property. Guests can also relax in the shared lounge area. Brantôme is 46 km from the bed and breakfast. Limoges International Airport is 53 km from the property. Boasting barbecue facilities and a garden, Chez Daisy features accommodation in Montbron with free WiFi and pool views. Including a terrace, this apartment also has a restaurant. This apartment features 1 bedroom, a satellite flat-screen TV, and a kitchen with a dishwasher. A continental or Full English/Irish breakfast is available each morning at the property. The apartment offers an outdoor pool. A children's playground is available on site and cycling can be enjoyed within close proximity of the property. Angoulême is 40 km from Chez Daisy, while Brantôme is 45 km away. The nearest airport is Limoges International Airport, 81 km from the accommodation. Boasting a garden, an outdoor pool and pool views, chez daisy is set in Montbron. Guests may go for a swim in the private pool and enjoy the free WiFi. The holiday home is composed of a fully equipped kitchen, and 4 bathrooms. A flat-screen TV with satellite channels and a DVD player are available. Continental and Full English/Irish breakfast options are available every morning at the holiday home. Chez daisy offers a barbecue. A terrace is available for guests at the accommodation to use. Angoulême is 39 km from chez daisy, while Brantôme is 45 km away. The nearest airport is Limoges International Airport, 81 km from the holiday home. Three-Bedroom Holiday Home in St.Barthelemy de Buss. Three-Bedroom Holiday Home in St.Barthelemy de Buss. Is situated in Saint-Barthélemy-de-Bussière. Guests may enjoy free WiFi. The holiday home includes 3 bedrooms and a kitchen with a microwave and a fridge. A TV is available. The holiday home offers a children's playground. Brantôme is 40 km from Three-Bedroom Holiday Home in St.Barthelemy de Buss.. Limoges International Airport is 50 km away. Set in Augignac, Holiday home Pouzol features a private pool. Guests staying at this holiday home have access to a fully equipped kitchen. The holiday home is fitted with a TV and 3 bedrooms. The holiday home offers an outdoor pool. Brantôme is 32 km from Holiday home Pouzol. Limoges International Airport is 70 km away. Situated in Saint-Mathieu in the Nouvelle Aquitaine region, 41 km from Limoges, L'Hirondelle Chambres d'Hotes boasts a sun terrace and views of the garden. Free private parking and free WiFi are available on site. Every room has a private bathroom. For your comfort, you will find free toiletries and a hairdryer. L'Hirondelle Chambres d'Hotes features free WiFi throughout the property. You will find a shared lounge at the property. Four-course, home-cooked evening meals are available upon prior reservation at an extra charge. Guests can enjoy various activities in the surroundings, including horse riding, cycling and fishing. Angoulême is 47 km from L'Hirondelle Chambres d'Hotes, while Brantôme is 41 km from the property. Limoges International Airport is 36 km away. Set in a small hamlet 3 km from the village of Varaignes, with its shops and restaurants, Chez Marot is a one-bedroom holiday home with a small garden and 2 terraces. Free WiFi is available throughout. There is a fully fitted kitchen/diner, a living room with a wood burning stove and TV with UK, French and German channels. The spacious en-suite bedroom leads on to a private rear terrace with table & chairs, barbecue and sun loungers. There is also a small utility room with additional toilet and washing machine. Brantome with its abbey and an 11th-century bell tower, canoeing and Friday market is only 40 minutes away. The lake and beach at St Estephe is 20 minutes away and the nearest city, Angouleme, can be reached in just 45 minutes. On site, there is ample free parking with garage space for cycles and motorcycles. Lieux-au-lac is situated in Augignac. It has a private beach area, barbecue facilities, lake views and free WiFi. This holiday home features a living room and a fully equipped kitchen with a dishwasher and an oven. A flat-screen TV is offered. The holiday home offers a terrace. There is a garden at this property and guests can go cycling and fishing nearby. Brantôme is 31 km from Lieux-au-lac. Limoges International Airport is 69 km from the property. Three-Bedroom Holiday Home in Marval is set in Marval. Complimentary WiFi is featured. This holiday home has 3 bedrooms, a TV, and a kitchen. The holiday home offers an outdoor pool. Limoges is 49 km from Three-Bedroom Holiday Home in Marval, while Brantôme is 47 km from the property. Limoges International Airport is 46 km away. Set in an 18th-century house, Les Cerisiers is a Charente holiday home located in Massignac. Guests will find a 2-acre garden with view of the nearby lake and terraces. The property also offers free Wi-Fi access. Les Cerisiers features 3 double bedrooms, a bathroom with a bath tub and a shower and a separate shower room. Guests will prepare their meals in the house's fully equipped open plan kitchen, with kitchenware, a refrigerator, a microwave and a dishwasher. On site, there is a tennis table. Walking paths can be found around the lake 100 metres away. Chabanias Train Station is a 20 minute drive away and Limoges Airport a 42-minute drive from this property which offers free parking. Cheronnac house and Meadow is situated in Chéronnac and offers a garden. Guests staying at this country house have access to a fully equipped kitchen. The country house features a flat-screen TV. Fishing can be enjoyed nearby. The nearest airport is Limoges International Airport, 46 km from the property. Featuring free WiFi and garden views, 4 Le Mas is a detached 1-bedroom cottage, situated in Videix. Guests have private use of the garden. Free private parking is available on site. There is a dining area and a kitchenette equipped with fridge. Towels and bed linen are featured at 4 Le Mas. Bike hire is available at the property and the area is popular for cycling. Limoges is 43 km from 4 Le Mas, while Angoulême is 46 km away. Offering garden views, L'Auberge in Abjat provides accommodation and free bikes. Free WiFi is featured. Each unit has a fully equipped kitchen with a fridge, a seating area with a sofa, a flat-screen TV, a washing machine, and a private bathroom with shower. Some units include a terrace and/or a patio with pool views. The bed and breakfast offers a continental or buffet breakfast. L'Auberge offers an outdoor pool. There is a garden at this property and guests can go cycling and canoeing nearby. Brantôme is 35 km from the accommodation. Limoges International Airport is 56 km from the property. Featuring a garden, Gites Limousin is a semi-detached holiday home set in Videix in the Limousin Region. Guests benefit from free WiFi and private parking available on site. The kitchen has a dishwasher and a washing machine. Towels and bed linen are featured in this holiday home. Other facilities at Gites Limousin include a barbecue. Limoges is 42 km from Gites Limousin, while Angoulême is 47 km from the property. The nearest airport is Limoges International Airport, 36 km from Gites Limousin. Below here is the hotels map of Busserolles. Names and details of Busserolles hotels can be shown on the map clicking on the prices icons.